“Foreclosed houses do not obtain lower property tax assessments until banks sell them. So tax revenue will keep falling until banks sell all the houses they end up with, creating a long-term lower tax base.” Basically this means that no one will know the full extent of this economic crisis until all of those foreclosed homes are re-assessed at dramatically lower values resulting in dramatically lower property taxes being paid over a long term. But there is another result as well. Property taxes upon which local governments are dependent may not be re-assessed until the banks sell the properties, but homes in community associations that are in foreclosure for non-payment of the monthly mortgage most likely are also delinquent in their homeowner assessments. Banks don’t start paying these assessments until they actually complete foreclosure and obtain title. The article states: “In the East Bay, banks own more than 10,000 homes, only a fraction of which are listed for sale. Another 20,000 are in foreclosure headed toward bank ownership.” But “headed toward bank ownership” is not bank ownership, and until the foreclosure is completed, the banks pay nothing toward the costs of maintaining the home which community associations must continue to pay. A healthy fraction of those 20,000 homes are in community associations and while the bank foreclosure process slowly continues, no assessments are being paid. Every community association will face a major reconstruction project several times in the life of the development. This may occur because of clearly anticipated problems, such as re-roofing or re-painting, but it also will occur because of completely unanticipated (and unreserved-for) problems such as dry rot repair, soil subsidence, and leaks in windows, siding, and foundations. The Davis-Stirling Act only requires that a community association reserve for those components that visual inspections into accessible areas reveal have a useful life of 30 years or less. But what about components in areas that are not visible or accessible? 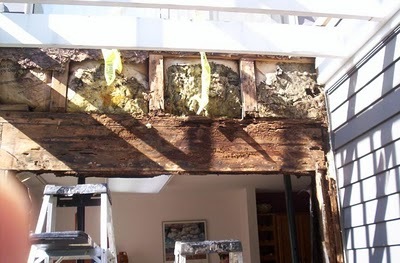 What about areas under staircases that sponsor dry rot due to long-term intrusion of water? Framing components under siding that have allowed water to enter slowly for years without any way to get it out except evaporation? Deteriorating concrete walkways or driveways due to the invasion of roots or soil subsidence due to unconsolidated fill? Or, balcony railings rotting off at their interior supports? As the last post revealed, three people in Antioch were severely injured recently when such a railing collapsed.